Below are some holiday offerings from Burt’s Bees; even though there are four sets below, there are over 30 available this year! They are great for every member of the family and also serve as the perfect stocking stuffer. The Beeswax Bounty Gift Set ($9.99) contains four of the extremely popular Burt’s Bees lips balms and a Bonus Woven Paper Change Purse. The change purse will hold all of your essentials – credit card, ID, and of course, a Burt’s Bees lip balm. The set comes in 2 variations: Classic, with four Beeswax Lip Balms or an Assorted Mix, with Beeswax Lip Balm with Vitamin E & Peppermint, Rejuvenating Lip Balm with Acai Berry, Replenishing Lip Balm with Pomegranate Oil and Nourishing Lip Balm with Mango Butter. The Tint ‘n Shine ($9.99) gift set contains coordinating shades of Tinted Lip Balm and the new Lip Shine! The set comes in two variations: Pink, with Tinted Lip Balm in Hibiscus and Lip Shine in Blush and Red, with Tinted Lip Balm in Red Dahlia and Lip Shine in Smooch. For those prone to dry, winter skin, the Bee Keeper’s Winter Care Kit ($14.99) is ideal. Containing the Richly Replenishing Cocoa & Cupuaçu Butters Body Lotion, Almond Milk Beeswax Hand Cream, and Ultra Conditioning Lip Balm with Kokum Butter, the kit is ideal for anyone spending any amount of time outside in the cold! Last but not least, the Party Lips set will keep you looking gorgeous at any holiday or New Year’s Eve party. 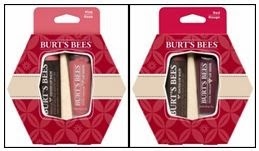 Each set contains two shades of the brand new Burt’s Bees Lip Glosses; the two variations are Pink, including Ocean Sunrise & Spring Splendor and Neutral, including Autumn Haze & Sweet Sunset. These lip glosses contain ingredients that will not only deliver rich color with high impact shine, but also enriches your lips with nourishing oils.